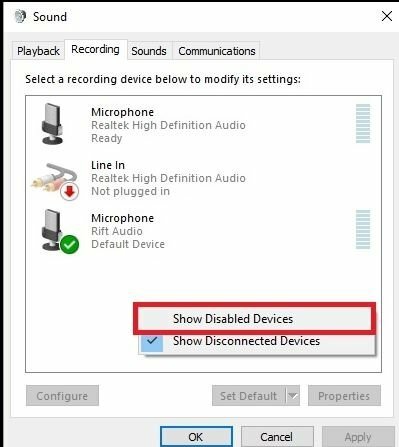 Then go to the Recording tab and right-click...Select Show Disabled Device. This will bring up the Stereo Mixer. Right-Click on it and enable it. 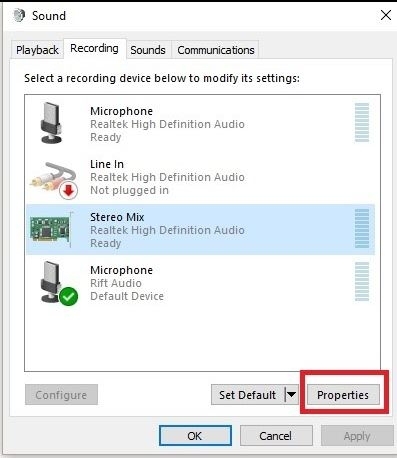 In the Properties, go to the Listen tab and then check the box "Listen to this device" . And that's it you are all set, you will now hear the sound from your speakers and your Rift! 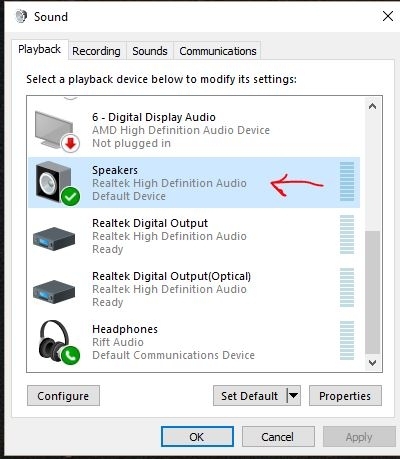 You can adjust the listening levels in the Levels tab of the Stereo Mix properties, but raising the volume of your PC will still raise the volume of your Rift, you can just create a volume offset between the 2 devices. The Vive has a 'mirror to device' option that is done by selecting your alternate output in a dropdown (one click). 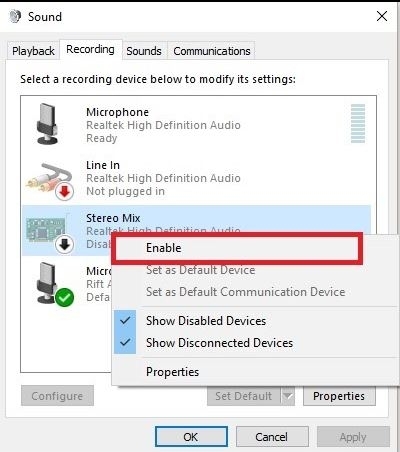 Oculus needs to provide an option in the Oculus Home settings for this, as it will be common when people want to listen to what the person in the HMD is listening to (VR parties and whatnot). 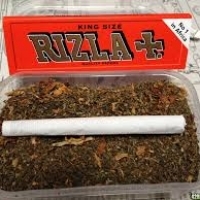 Not a problem I would try to make a sticky out of it with my mod powers lol but I can't find how. Would running through a standard sound card and mirroring to the rift cause problems with the oculus positional audio system built into the rift ? 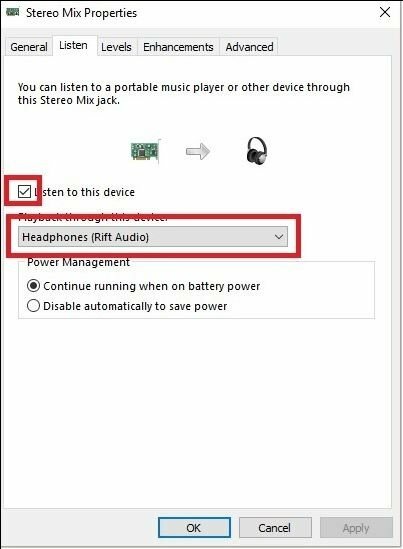 Is the positional audio hardware based in the DAC of the HMD or is it just a software trick in the SDK. Oculus did say they would look into a mirror function "soon"
Excellent work @maxpare79 , thank you! You mean you guys didn't undergo extensive training in how to do that sort of thing? Ok, he did say he doesn't like too many stickies, true. So would you say that this way of mirroring the sound is preferable to using other software like Voicemeeter? I don't want to do too much fiddling, but I also don't want to install software unless it's really needed, you know? This works flawlessly for me so I haven't done any more digging. Cheers mate, that's good enough for me. Hmm, interesting. Walled garden syndrome again, perhaps. Guess I'll have to look at Voicemeeter after all. Nevertheless, outstanding work @maxpare79 , even if it only works on Steam, it's still very useful, thanks again. Yeah I mostly play ED, Pcars and Assetto Corsa. which I own on Steam, never realized up until a few minutes ago when someone came over for a demo that when he was trying Lucky's Tale, Chronos and Dreamdeck that I couldn't hear anything. @RobHermans I am betting it is more of a software/hardware support issue rather than a walled garden issue. Oculus Home will eventually need to support this functionality as it makes it much more fun to spectate. Having it as a one click option is a very nice feature. And thanks for the update max! Agreed. Note to self: stop using popular phrases inappropriately! Thanks for the walk through max. so it works for steam but ironicaly not for OH purchased games ?. hmm I was sort of hoping to see what it was like when play eve-valk. which oculus dev do I have to kidnap to get it to work with OH ?. @ Maxpare79 - Did you try this for your steam games, it seems simple but I haven't tried it because I don't have my CV1 yet. max ....can you get cyber to sticky this thread for future reference ?. No harm in asking. My guess is that he will say he doesn't like too many sticky threads. I do have a suggestion which I might put to him though: create a separate category for FAQs. Threads asking questions which have already been answered are way too common on these forums, mainly because the search function isn't very powerful. Imo a category dedicated to helping new users to answer the most common questions will at least lessen the clutter in the General and Support categories. seems a bit ironic that steam does support for these types of systems ...yet oculus home doesn't ...especially as oculus are trying to encourage us all to purchase their games through OH yet doesn't support this particular feature . By any chance, have you tried going the other way--using the mixer to listen to the Rift audio when you're playing an Oculus Home game? This seems to be specific to realtek. 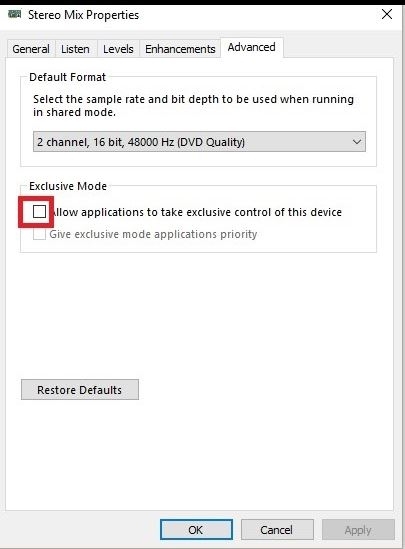 I can't get this option to pop up on windows 10 anniversary. Is Oculus going to allow this feature? At the moment I'm using steamvr, and doing the alt tab method discussed on reddit. This SOMETIMES works and gives the least amount of delay as far as I can tell. (If you haven't already) Setup SteamVR to mirror audio to 'Rift Speakers'. Launch game via Oculus Home. At this point I find my SteamVR home environment scene replaces the game, to fix this simply alt-tab back to the game to regain focus. I want this feature in the worst way, and it doesn't make sense that it doesn't exist as an option in the home settings. There is nothing to gain by not allowing us to do this at all. It is actually counterproductive for people watching because they aren't getting the full sensory experience of watching and listening to what is being played by the person in the Rift. 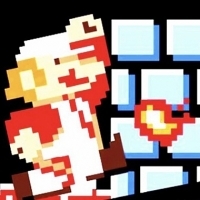 It is actually counterproductive for people watching because they aren't getting the full sensory experience of watching and listening to what is being played by the person in VR. Please add this oculus, it will make it much more enjoyable for a party scenario. There are multiple threads on this already, but in case you didn't know, Oculus has already stated (half a year ago) that they're working on implementing audio mirroring, just like Steam has. What is taking them this long is beyond me. For the time being you can use Voicemeeter.